Situated in northern Gauteng and bordering Johannesburg in close proximity, Pretoria is one of three capital cities in South Africa. Pretoria acts as the executive and de facto national capital, while Cape Town and Bloemfontein serve as the legislative and judicial capitals, respectively. Nicknamed “Jacaranda City”, Pretoria is also known by another name: Tshwane. A long debated topic of name change has resulted in a divide whereby different groups, both racially and politically motivated, have adopted different names for the city. 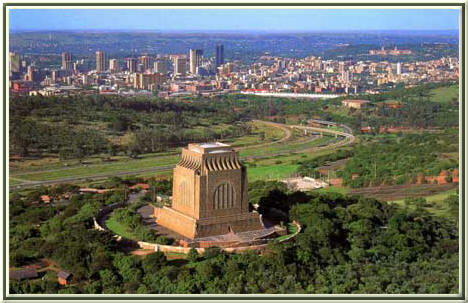 The city was originally named after the Voortrekker leader, Andries Pretorius. The land, before 1600, was the home of the Southern Transvaal Ndebele who had occupied the river valley up until that time. Marthinus Pretorius founded the city in 1855 who then named the city after his father, a hero to the Voortrekkers. His victory over the Zulus in the Battle of Blood River, as well as his negotiations in the Sand River Convention whereby the Transvaal became independent from the British and subsequently the capital of the new South African Republic, made him a popular figure. This moment in history is also recognised by many as the end of the Great Trek. Roughly 55km north of Johannesburg, Pretoria lies on the transitional belt between the plateau of the Highveld to the south and the Bushveld to the north. Surrounded by the Magaliesberg mountain range, this land is fertile and sheltered, creating the valley within which Pretoria lies protected.